The former NATO Secretary General Anders Fogh Rasmussen succinctly paraphrased this point of the Treaty as „all for one, one for all”,1)Introductory remarks, NATO 2012-02-28.of which it does not follow, however, that Article 5 imposes on Member States the commencement of armed operations but only obliges them to take such steps as a member state deems necessary. However, two similar circumstances and two similar resultant operations have brought about two strikingly different political evaluations. The attacks of September 11, 2001 were defined by Washington as a violation of the security and integrity of the country, which became the basis for invoking Article 5 of the North Atlantic Treaty.2)Invoking Article 5, NATO Review 2006.Nine days later George Bush said: „We will pursue nations that provide aid or safe haven to terrorism. Every nation, in every region, now has a decision to make. Either you are with us, or you are with the terrorists. From this day forward, any nation that continues to harbor or support terrorism will be regarded by the United States as a hostile regime”.3)Speech to Joint Session of Congress – G. Bush, PBS 2001-09-20. Notice that the attack on the WTC was not made by a state, but by a terrorist organization. However, as the above quote suggests, the United States has recognized the right to legitimize a preventive attack on states that provide shelter to organizations whose activities are hostile to Washington’s interests. This justification was the commencement of the military intervention in Afghanistan and Iraq, which met with the acceptance of allies under the North Atlantic Treaty. The events triggered in 2001 are reflected in the Turkish conflict with the Kurdistan Workers’ Party (PKK), which seeks to create its own state, carving out a huge chunk of Turkish territory. Both Ankara and Washington view it as a terrorist organization, which from Ankara’s point of view is all the more serious because it threatens the country’s territorial integrity. 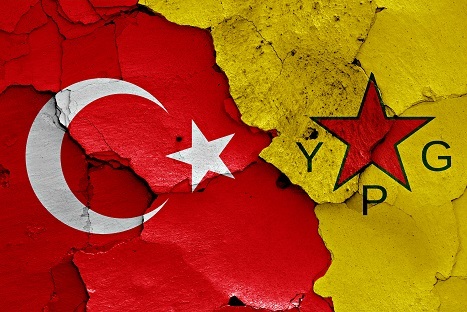 PKK’s militia is known Soros People’s Protection Units (YPG), which form the backbone of the Syrian Democratic Forces supported by the United States in the fight against ISIS on the territory of Syria. 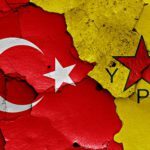 As a result of the growing threat from the PKK/YPG, Turkey decided on January 20, 2018 to carry out a preventive attack on Kurds operating on Syria’s territory (operation “Olive Branch”4)Operation “Olive Branch”, launched by Turkey on January 20, 2018, is directed against the Kurdish forces in the border area around Afrin in northern Syria. ), whose aim is to create a buffer zone (not annexation of foreign land) ensuring the inviolability of Turkish borders. Both operations – the one launched by Ankara and the one mentioned at the beginning of the text – overlap in three respects regarding Article 5. (I) both countries define uncomfortable groupings as terrorist organizations, (II) call their own military operations preventive and (III) justify them as anti-terrorist actions. Ankara has already signalled that Kurdish units in Syria threaten Turkey, which was confirmed by the reference to Article 4 of the Treaty, which envisages consultation on granting support to one member of the alliance by the others.5)Why Turkey called a NATO Article Four consultation, The Economist 2015-07-28.Turkey used this provision to raise concerns about the territorial integrity of the state. This time the Western world perceived the Turkish military intervention in Syria differently than the American one in Afghanistan or Iraq. While Washington’s action and reference to Article 5 is considered legitimate, Ankara’s action is criticized. Does the North Atlantic Treaty Organization really rely on collective defense or does it only serve the interests of its most influential members? 1. ↑ Introductory remarks, NATO 2012-02-28. 2. ↑ Invoking Article 5, NATO Review 2006. 3. ↑ Speech to Joint Session of Congress – G. Bush, PBS 2001-09-20. 4. ↑ Operation “Olive Branch”, launched by Turkey on January 20, 2018, is directed against the Kurdish forces in the border area around Afrin in northern Syria. 5. ↑ Why Turkey called a NATO Article Four consultation, The Economist 2015-07-28.